Our workshops train members of your team in traditionally male-dominated activities while learning tools to confront the impacts of patriarchy and how to create a healthier working environment. These fully tax-deductible workshops empower the participants on your staff and build on the skills to become leaders in their communities and the workplace. Our workshops offer your team hands-on skill building and facilitated discussions that examine the learning experience and how societal myths have kept women from actively participating in traditionally male spaces. Our workshops empower the participants to recognize and dispel the myths of frailty. We do this through dialogue and exploration of their physical capabilities. Members of your team who attend this workshop will learn incredible team building and leadership skills in an environment that builds their confidence and empowers them to explore their strengths. These workshops are built around teamwork, trust, and partnership. These are skills that are essential to building a more just and healthy workplace environment. Additionally, at Frailty Myths, we know that when women and trans folks explore our physical strength and capabilities, we learn to recognize the myths of frailty that hold us back. Complete the contact form below to inquire about rates and availability. Now more than ever, women need a space to dismantle the myths that tell us we cannot be strong, we cannot be leaders, and that we cannot change our community. These myths impact us in the workplace and in our relationships with each other. With Frailty Myths, they can be overcome. Together, we are facing these myths head on. 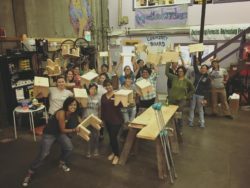 We build empowerment by offering workshops for women in the skills that have been off-limits to women for generations. In addition, we learn those skill within the context of our lived experience. 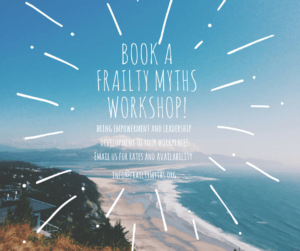 It doesn’t matter what field or industry you are in, Frailty Myths workshops provide an experience and skills that translate to every aspect of life. Frailty Myths also provides consulting and facilitated conversations around how gender, race, and other forms of oppression show up in the workplace and within teams. We come from an intersectional perspective and our team has years of experience facilitating difficult conversations with transformative results. Our facilitators will work with you to develop an agenda that is specifically suited to your teams needs and struggles. Frailty Myths has drawn on years of research to offer a proven method of hands-on engagement and skills-building opportunities for our participants. Our facilitators allow participants to see themselves in positions of leadership and power. You can read more about our pedagogy here. Members of your team who attend this workshop will learn incredible team building and leadership skills in an environment that builds their confidence and empowers them to explore their strengths. Each workshop participant will leave with a pathway for physical and social empowerment that translates to every part of life. See testimonials from former workshop participants here. Frailty Myths workshops are built on teamwork, trust, and partnership. These are skills that are essential to building a more just and healthy workplace environment. These workshops allow women the space to explore new skills and discover a confidence that often goes undernourished. 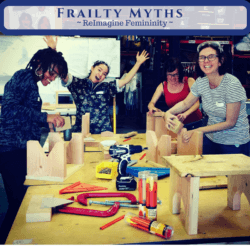 Beyond this, each Frailty Myths workshop includes space for women to engage in a group conversation about the societal myths surrounding femininity, frailty, strength, and leadership. That is followed by real and tangible tools on how to overcome these dynamics in the workplace. By providing women, trans, and gender non conformation members of your staff the opportunity to participate in a Frailty Myths workshop through your nonprofit, office, or community group, you also help Frailty Myths provide free workshops, training, and empowerment resources for women and gender-non conforming folks across the country, specifically in marginalized and low-income communities. Fill out the form below for rates and availability. Also, to set up a free consultation about how Frailty Myths can work with your team.